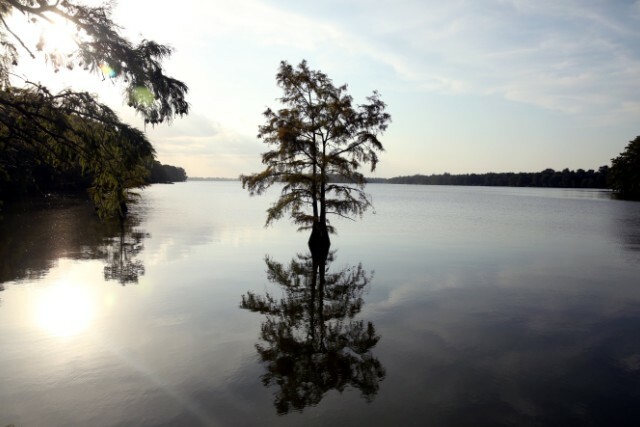 Lake Providence, Louisiana (CNN) -- Delores Gilmore used to have a dream. The 44-year-old overnight prison guard grew up on the south side of Lake Providence, the crescent moon-shaped body of water that generally divides the haves from have-nots here in the northeast corner of Louisiana. It's a place where the air is so soupy-hot your shins sweat; where bugs are such a looping, whirring presence that it can feel like you're trapped in hell's version of a snow globe; and where the level of income inequality, as persistent as the bugs and humidity, is higher than any other parish or county in America. It's not a place where dreams live long. Not south of the lake, at least. North of Lake Providence, on a side of town Gilmore rarely sees, there are tennis courts and ski boats, swimming pools and manicured estates. The lake is less than a mile wide, but the north side might as well be a world away from Gilmore, who earns $8.50 per hour working 6 p.m. to 6 a.m. and still is two months behind on some of her bills. "I get it done. By the grace of God, I get it done." A dozen or so family members rely on her for financial support. Her daughter, who has three children, lives across the street in a trailer so leaky that, despite her efforts to tar the roof to prevent rain from seeping through, it has mushrooms growing from the ceiling, like something out of "Alice in Wonderland." Stray dogs hound her door. Gilmore's life is consumed with the needs of her family. In her recurring dream, though, Gilmore got a peek at another life. She was in a big house -- a nice house, nicer than any she'd ever seen. "It was beautiful," she said. "It had upstairs, downstairs. Four bedrooms upstairs, four bedrooms downstairs. It had a guesthouse in the back. It had four bathrooms. There was a living room and a sitting room. It was just beautiful." Gilmore, a stern but funny lady who answers the door saying, "What now?!" and carries a switch to church in case her kids act up, never wore shoes in the imagined house, only socks. Her real living room floor is made of splintered plywood. But the floors in the dream home were smooth as a skating rink. In the dream, Gilmore ran through the halls and slid across the floor in her socks -- just like Tom Cruise in "Risky Business." In that moment, she felt free. Gilmore told me about her dream while we were driving along the south side of Lake Providence in her 2005 maroon Ford Taurus, a pair of fuzzy dice and four air fresheners hanging from the rearview mirror. Cypress trees zipped by the car. The rich side of the lake was blurry as we drove parallel to the southern shore, but I knew it was there. I'd already met some of the wealthier northsiders and seen their lakefront homes. I'd also looked at the statistics: This place has a wider gap between rich and poor than Manhattan, with its Bentleys and billionaires -- or than any country on Earth. I'd learned that, whatever we tell ourselves about America being the land of opportunity, our country's rules are designed to make it likely Gilmore will stay here on the south side of the lake, in the modest white trailer where she raised eight kids, including a stepson and a nephew whom, she said, her sister abandoned on a street corner in town. Personal choice, including her decision to have so many children, plays a role in it, of course, but the choices in front of her are limited by a host of factors, including an income that won't support her family. She doesn't blame anyone for that -- doesn't bemoan the wealth here. She absolutely loves her job. But, to use a popular metaphor, the middle rungs of the economic ladder have vanished in Lake Providence. There's almost no middle class. How could a person climb up? As I listened to Gilmore recount her dream, however, anything seemed possible. My journey to Lake Providence started with a poll. Readers of this column voted for me to cover income inequality as part of my Change the List project, which focuses on pushing for social change in places that fall at the bottom of an index or ranking. With 32,000 votes tallied, America's rich-poor gap was the top pick. In your eyes, it's the No. 1 social justice issue of our time -- a continuation of the civil rights movement, which included a push for jobs and economic justice as well as racial equality. Since the late 1970s, the gap between rich and poor has widened to Grand Canyon proportions -- pushing America toward a two-class society. People have a harder time getting ahead now than at any time since the Great Depression. The nation is more economically split, according to the CIA, than Iran or Nigeria. East Carroll Parish, population 7,500 and home to Lake Providence, is worse off still. 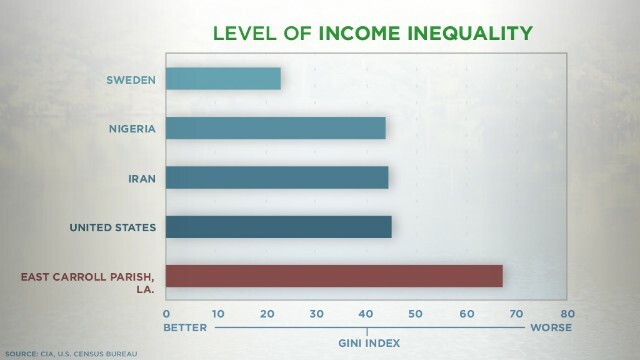 A Gini index score of 0 means everyone earns the same income; 100 means one person earns all income. Lake Providence is a place of incredible natural wealth. It was named by people who floated down the Mississippi, past throat-slitting pirates, and found refuge at the beautiful, cypress-lined lake. "If a crew was fortunate enough to get safely past the pirates to the trading post at the lake below, they thanked Providence for sparing them," according to one local history. "Thus, the lake and settlement acquired the name of Providence." They were the chosen people -- the ones God had spared a nasty fate on the river and led to the fertile land of the Mississippi Delta. Now, Lake Providence is at the confluence of the river and two highways. It's well situated for economic development. Yet divisions hold it back. The rich largely live north of the lake and the poor on the south. They go to different churches and attend different schools. They have different friends and work different jobs. 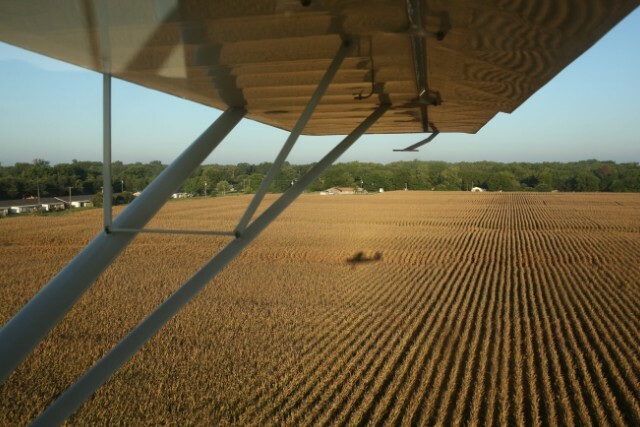 Many of the richer people in town own land and run farms that produce corn, cotton and soybeans. Poorer people used to work on those farms, but they've largely been replaced by the Transformer-size machines you see driving along the road during harvest. There are few nonfarm businesses in town. On the main strip, you'll find The Banner-Democrat, the local newspaper with half of the letters missing from its sign; a "Price Cutter Discount Center," which advertises balloons and party supplies in a community that seems to have need for neither; and a corner store called Unique Fashion, which is where I found Michael Owens on a summer afternoon, sitting in a metal chair in front of an industrial-strength circular fan. "DEAD!" he said, without pause. "I ain't seen a customer all day." The best a non-land-owning person can hope for here is a job at the prison (the sheriff's department is the largest employer), a bank, the schools or one of several restaurants, including The Dock, which sits on the lake and has a giant crawfish on its roof. There's also Uncle Darrell's, a convenience store on Second Street, on the south side of the lake. Everybody knows that, outside, that's where you're likely to find the drug dealers. Race is part of the divide, to be sure. Land was given to white families in the 1800s, not to blacks. The town resisted integration in the 1960s and '70s, and at least one voting rights activist was shot in the parish during that struggle. The history of slavery and discrimination is still present. But class has become the new barrier -- one that is both persistent and legal. The richest 5% in the parish earns $611,000 per year on average. That's 90 times what the bottom fifth makes per year: $6,800. And 16% of parish residents are unemployed. 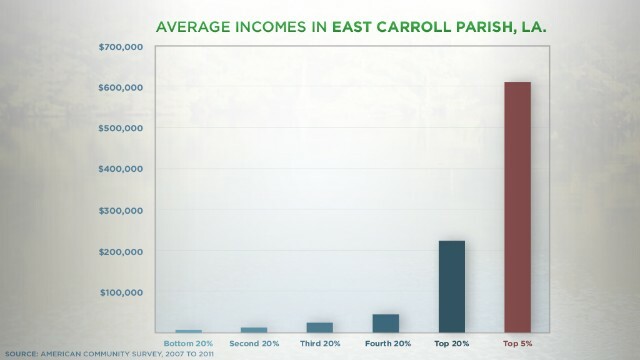 East Carroll Parish, Louisiana, has almost no middle class. Despite the divide or maybe because of it, I was hard pressed to find people in Lake Providence who think income inequality, specifically, is a problem. This is the way things are, they say. The gap is so big they no longer can see across. Delores Gilmore's mother learned to sleep with the sound of wolves clawing at the walls of the family's two-room, wooden home on a cotton plantation. She used an outhouse instead of a toilet and pumped water from a spigot. In the middle of the night, instead of going outside to fend with wolves, she relieved herself in a "slop jar," a small container with a lid they kept next to the bed. For food, the family tended a garden, and her father hunted deer. But Dorothy Jones recalls living for a day or two at a time on nothing but water. "It was rough on the stomach," she said. "I know that." Jones, now 60, started working the cotton fields at 10. At 12, she became pregnant. She left school and kept working in the fields, strapping the infant to her back and walking up and down the rows of cotton, the white-hot sun breathing down on her. Her starting wage: $3 per day. But, like so many others here, she's not one to complain. "I guess I just had to get used to it," she said. Gilmore, her third child, was born in June 1969, six years after the March on Washington and six months before the federal government forced local public schools to integrate. She came into this world at a time of great hope -- when it seemed like Lake Providence, a place that always had been segregated by race, might be entering a new era. Her mother staked her dreams on Delores. She was the resourceful one. She had a quick temper but also an infectious laugh. When the family ran out of food, she went looking for help from relatives. She rolled with the punches. It seemed like she might be the one to break free. 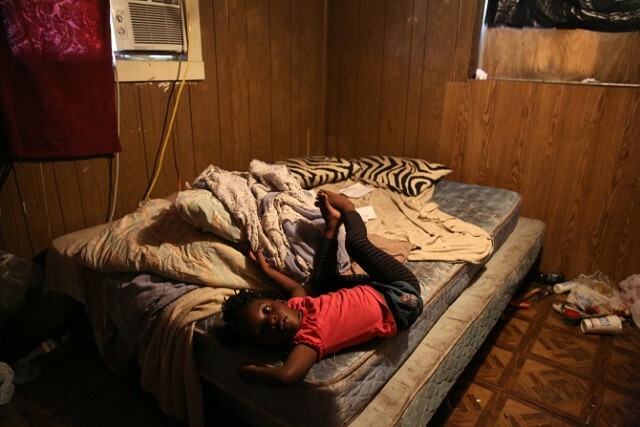 Lake Providence largely divides rich from poor in rural Louisiana. One street in Lake Providence connects south to north. Heading north, the road curves past a furniture store with windows covered in American flags and massive images of Marilyn Monroe, the 1950s movie star who spent part of her early life in foster care -- a symbol of the idea that anyone can make it in this country. The road continues into neighborhoods with towering trees and well-trimmed lawns. Not all the houses on the north are massive. Some have the feel of a 1960s retirement community -- stone birdbaths, lawn trinkets. A few trailer homes are in the mix. A quick drive-by could leave you with the impression there's not much wealth here. But squint past the trees and you'll see wrap-around porches, columns, a private tennis court, pools and manicured shrubs. The billionaire Sam Wyly grew up in town, and his cousin, according to his book "1,000 Dollars and an Idea," lives in an antebellum home north of the lake. "I grew up with the American idea that you pull yourself up by your bootstraps -- that you work hard and you do the best job you can ... and you make a living." That's Thomas Terral, 71, who's said to be one of the richer men in the parish. His family name is on a seed storage tower on the south side of town. The Terrals owned and operated several farm-related businesses for decades. Terral and other northsiders live by what I'll call the Bootstrap Ethic -- that you can work hard, get a good education and get ahead. It's the American Dream, really. The ethos has served Terral well, although it would be hard to argue he's needed it much. The son of a doctor, Terral told me he took over a part-family-owned seed business with a loan his father financed and, after he had made some payments, partially forgave. Terral Seed became the largest business of its kind in Louisiana under his watch. He sold it in 2010 to DuPont, the international chemical company, according to news reports. He's a great businessman, sure. But it seems his bootstraps were pretty well pulled. He lives a life of relative luxury -- nothing that would seem outlandish by national standards, but it is a far cry from life south of the lake. His living room has the vibe of an upscale ski lodge, with the heads of various animals -- one is a bighorn sheep, I think -- staring at you from elevated angles. In the office, a bear rug has its mouth open, fangs showing. Terral shot it with a bow and arrow on a hunting trip in British Columbia. On the coffee table is a copy of Forbes magazine. Cover story: "Peace Through Profits." That title embodies his thinking. "I felt like my mission was to supply as many jobs as I could," he said. "Of course, we were a small company, and I think the most employees we had was a little under 70 -- 68 or so. What we did was probably the best thing we could do to help the situation." By "the situation," he means the poverty south of the lake. Some wealthy people north of Lake Providence won't speak of it -- nor do they know much about the situation. Several declined my interview requests. I have a feeling Terral was gracious enough to talk with me because he's seen the south side of the lake -- and he has a genuine sense of service to the people there. He has volunteered on the south side, working on homes. And he met many people there as a young boy when he followed his dad on house calls. Terral would chat with families while his father, the doctor, tended to the sick and delivered babies. One of them was Delores Gilmore. He brought her into the world free of charge. Delores Gilmore was baptized in Lake Providence. It was 1979. She was 9. The only time she'd been in the water before that, she nearly drowned. She hasn't been in the lake since the baptism, she told me. On summer days, when the sun heats the gooey air to what feels like a boiling point, you'll see white families zipping up and down Lake Providence in pointy-nosed sport boats, dragging their children behind them on inner tubes and water skis. Occasionally the boaters wave to a stranger on shore. But it's almost unthinkable Gilmore could afford to join. By 16, Gilmore got pregnant and dropped out of school, just as her mother had. She went to work in the sweet potato fields west of town. And by the early 1990s, Gilmore had five children and was raising a stepson and a nephew. She didn't really have room for the extra kids in her crowded home. Nor did she have the money. She already was having trouble affording underwear for her own children. Valtakia Jones has been unemployed for four years. But she hasn't given up hope. But they were family. She had to help. Gilmore's nephew, then 11 months old, was abandoned by her sister on a street corner downtown, she and other family members said. Gilmore suspects her sister has an undiagnosed mental illness. She later would try to burn her mom's trailer down in a fit of rage -- and would stab her mom, the family said, only to say she didn't remember the incidents afterward. She currently is serving a prison term, online records show. Gilmore isn't angry with her sister. She had problems no one here could seem to address. Gilmore kept striving for a sense of normalcy. For years, she had a boyfriend who helped. He was the father of four of her children, and he gave Gilmore a financial cushion and moral support. When they first met, she found him arrogant. But her friends convinced her to give him a chance. She eventually was drawn to a softer side he usually kept hidden. Then, in 1994, only three years after the birth of her fifth child, Gilmore got a phone call that would change her life. Her boyfriend had been shot in the head. Two weeks later, his family pulled him off life support. His mother didn't want to pursue an investigation, Gilmore said, so the circumstances of his death remain unclear. The results were all that mattered to Gilmore. She lost her protector, and the kids lost theirs. You could blame Gilmore's hardship on bad luck, but huge income gaps also are associated with gaps in empathy and trust, and that eventually morphs into hopelessness. Surprising links have emerged between income inequality and a host of social problems, including mental illness, substance abuse, incarceration, educational failure, teenage pregnancy, lower life expectancy, violence and infant mortality. Such links don't exist when you look just at average income. The inequality itself is to blame. This is well documented in a book called "The Spirit Level" by epidemiologists Richard Wilkinson and Kate Pickett. Drawing on decades of work, the researchers found, essentially, that people who live in economically unequal places -- such as Louisiana or the United States as a whole -- tend to live harder lives. Not just poor people. All people. 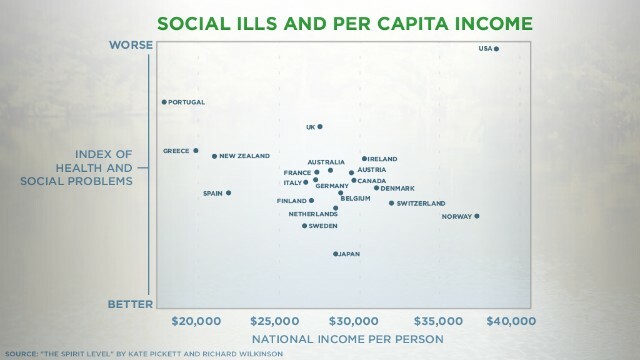 When the researchers plotted income inequality against an index of social problems that included infant mortality, mental health and others, they got the chart below, which shows that more unequal places tend to have more of these issues. The United States, the most unequal of the developed countries, for example, also has the world's highest incarceration rate and a higher infant mortality rate than comparable nations. Sweden, meanwhile, has a low level of income inequality and fares much better on these social measures. 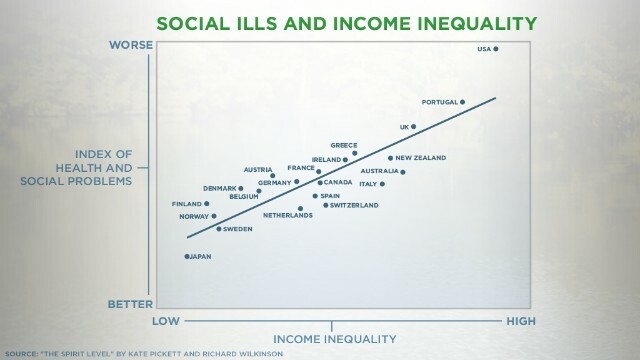 Social ills are associated with societies that have high income inequality, research shows. No clear relationship exists between per capital income and social problems, research shows. The researchers suspect gaps in trust and empathy likely contribute to these gaps in health and social cohesion. More unequal societies also tend to have lower levels of trust, they found. In Louisiana, for example, only slightly more than a third of the population says it trusts most people, according to "The Spirit Level." In more-equal North Dakota, that number jumps to 67%. Inequality in America has grown in tandem with a host of factors. And things weren't always this way. In the 1950s and '60s, the U.S. was remarkably egalitarian. The economist and former Labor Secretary Robert Reich says he's often asked what society the United States should emulate if it wants to address income inequality. His answer: the United States. Back then, things were markedly different. Labor unions gave workers a voice. The minimum wage, adjusted for inflation, was higher than now. College was affordable. And the super-rich were taxed at a higher rate. Now all of that's changed. 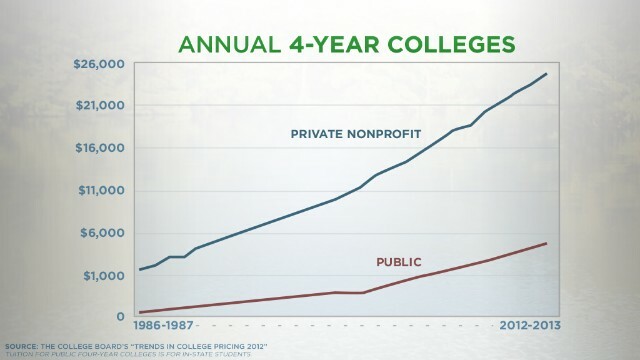 The price of college, one way out of poverty, has skyrocketed, as CNNMoney reports. College, one route out of poverty, is more expensive than it once was. The minimum wage is worth less now than it was in the 1960s. 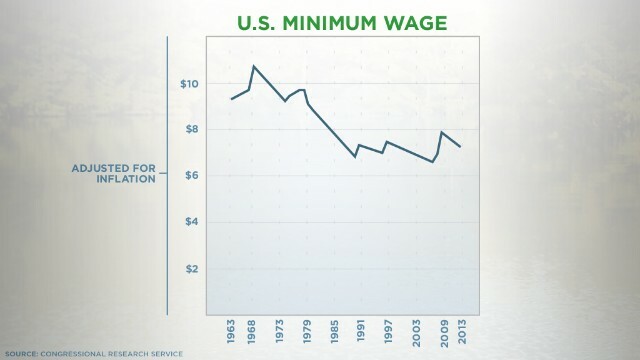 The U.S. minimum wage is worth less now than it was in the 1960s. 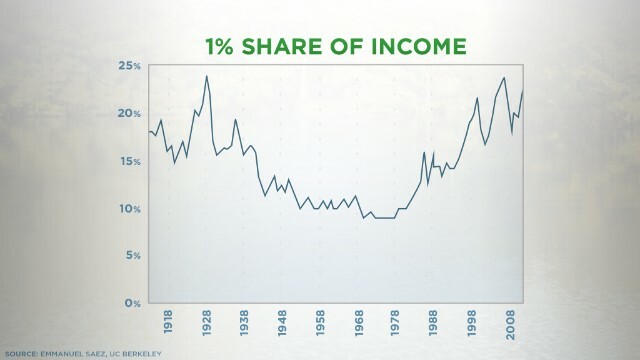 And the tax rate on the richest Americans, as the documentary "Inequality for All" noted, has dropped considerably. 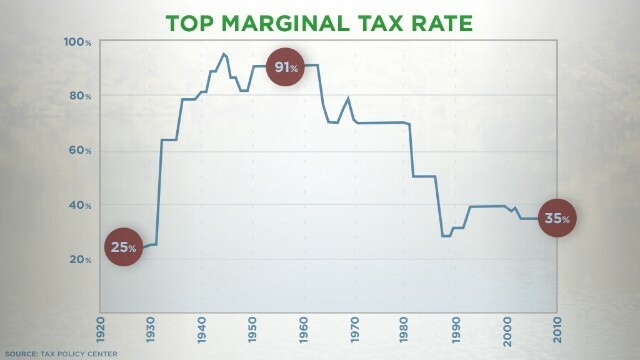 The top marginal tax rate has dropped considerably since the late 1970s, according to the Tax Policy Center. Meanwhile, the country's now famous 1% continues to coast through the wake of the economic recession. They're faring better than anyone else. The U.S. 1% has fared better in the recession than others. These issues are national, but they affect the dynamics of life in Lake Providence, and of every other community in America, in ways that are both common and unique. In New York, where the mayor is a multibillionaire and the race for his successor has largely focused on this topic, inequality has skyrocketed as Wall Street traders and CEOs receive otherworldly compensation. In the Rust Belt, the decline of manufacturing jobs has helped hollow out the middle class, striking a serious blow to the idea that anyone who works hard, regardless of family background, can live an economically stable life. And in the Deep South, economic justice is an extension of civil rights. "It'd be a better town if we could get some jobs," Delores Gilmore said. "I do believe that. I believe that from my heart." Every mother wants a better life for her children. That's why Gilmore agreed to send two of her sons away. Her middle children, Stanley and Liray Jones, were going to drop out of high school in Lake Providence, she said. Rarely a week went by that fights didn't break out at the school, she said. She didn't think it was safe -- or an environment for learning. So, with their OK, she sent her only two sons to Texas to live with a relative. She misses them constantly. But they graduated, she said. They found a better life. Gilmore's kids who stayed in Inequality USA have not. Samantha Jones is 28 years old. Her boyfriend, family members said, was shot in April 2010 when an altercation broke out near a convenience store in downtown Lake Providence. He was hit by a stray bullet, according to a news report. Valtakia Jones, 22, has been looking for work for four years. She left school four months shy of graduation to care for her second child. For about a year, she gave up on the job search completely. She felt like she was unemployable -- like something was wrong with her. Recently, she's gotten a second wind. There's still some fight left in her, but talk to her about the job search and you can hear the life start to drain from her voice. Not long ago, she got an interview at McDonald's in Oak Grove, Louisiana, about a 20-minute drive west of Lake Providence, in the next parish over. If she were offered the job, she'd take it. But she doesn't know how she would get there. Her mom is the only one in the family with a car. Jones says she's hoping to walk to work, but that seems nearly impossible considering the job is more than 15 miles away. Maybe she could pay someone to drive her? Jones said she would do anything to make it work. For one, she wants to provide a safer place for her kids to live. The mother of three now lives in a sunken trailer across from her mom. Family members paid for the structure, which bows in the center, like a caterpillar inching forward. She's fixing it up the best she can. She painted half of the exterior blue before she ran out of paint; a friend helped her build a plywood cabinet to hold the sink. "If I can get this job, it's gonna be the bomb," she said of the trailer. Last I heard, McDonald's hadn't called back. Delores Gilmore's granddaughter lives in a trailer her mom is working to repair. Many people in Lake Providence never will climb out of poverty. The tools simply aren't available. Only 9% of kids from the bottom fifth of the earners in Lake Providence will make it into the top fifth, according to research from Harvard University and the University of California, Berkeley. America has tried to create systems that are designed to ferry people from one side of the lake to the other, or to at least stop them from sinking further. Government programs help pay for health insurance and day care. Food stamps have kept families from going hungry. And public schools have proven one of the best routes out of poverty. In Lake Providence, however, the education system seems to underscore class divisions. Kids from the north side of the lake go to Briarfield Academy. It has no formal scholarship program, its principal said. On the south, there's only one public high school. I toured both high schools and met both of their principals. They genuinely want what's best for their students. But neither has the full support of the Lake Providence community. Neither can truly succeed without that. Nationally, a 2011 study from Sean Reardon at Stanford University shows students from poor families test the equivalent of three to six years behind their rich peers. Three to six years behind. Middle-class jobs are another way for people to climb out of poverty. But those are scarce. Most jobs that do exist don't pay well enough for a person to meet his or her basic needs. That, too, starts to look more sinister when you look at the big picture. Across the country, workers are making just about what they did 30 years ago. But they're also more productive than ever -- producing far more stuff per hour now. If you're making more stuff and getting paid the same, where are most of those gains in productivity going? If you guessed to the wealthiest Americans, you'd be correct. That affects how a person like Gilmore is paid. If her wages had kept pace with productivity, she would make $31,300 per year, instead of about $18,000, according to an analysis by the Economic Policy Institute. That's a wage that might actually be livable. I first met Gilmore at a birthday party for her grandchildren. Kids were orbiting her mother's trailer like fireflies. There were candles and cake. Above the kitchen sink hung a dirt-caked banner that said, "Rejoice!" I was amazed with how lighthearted the mood was, especially when I learned that Gilmore's mother and partner were going to be evicted from their home imminently. They fell behind on their payments when Willie Pullins Jr., 63, lost his job on one of the larger farms in the parish, they said. Pullins showed me a stub indicating he was paid $6 per hour. He told me he fell off the back of a truck on the job, and instead of getting sufficient medical assistance, he got the can. And now, an eviction notice. Gilmore is trying to find $3,500 to buy them a new place. "You have to help one another if you want to survive around here," she said. "You ain't got nothin'. I ain't got nothin', but I'll give you whatever I've got." She's given so much that she's had to mortgage dreams of her own. Gilmore, who once worked as a certified nursing assistant, would like to go back to school to become a registered nurse. She's heard the pay is better, and she likes helping in times of need -- doesn't like to see people suffer, especially children and older folks. But every month she has to take out a payday loan to get by. Such lenders are known to charge the equivalent of 300% interest. How could she possibly leave work, much less pay for school? Sheriff Wydette Williams, Gilmore's employer, told me he would like to pay his employees more but that the parish is bouncing back from financial crisis. 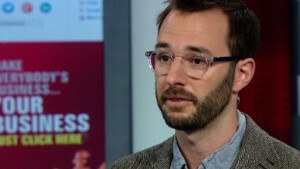 "That is my whole goal -- to provide the best for my employees," he told me. "This is not a political phrase. This is where I come from. I want to provide everyone with a decent wage and better working conditions. .."
During his tenure, he said, he brought health insurance to all of his full-time employees. 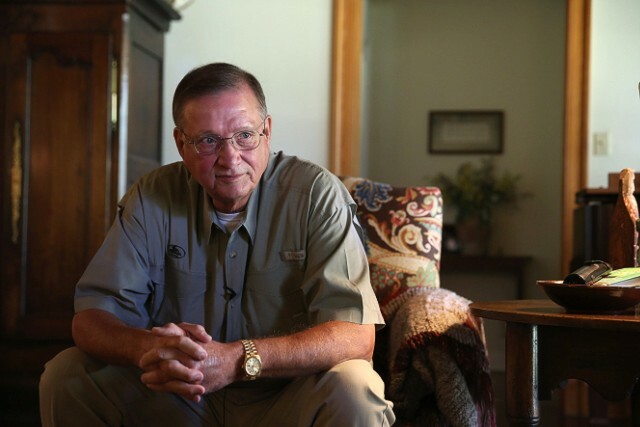 Thomas Terral grew up with a sense of service to poorer people in town. Looking across Lake Providence from the north can warp a person's vision. Find a modicum of success and it becomes all too natural to judge those who haven't. There must be something wrong with them, right? I made it, so why can't they? It's not intentional or evil. It's the product of an unjust system. When the gap between rich and poor is as wide as it is in Lake Providence, it becomes almost impossible for people to imagine themselves on the other side. It becomes all too easy, as many do, to argue that "entitlement" programs such as food stamps are holding back people on the south side of the lake. They don't have enough incentive to work hard and get ahead. They become lazy, complacent, dependent. A closer look at how these programs work reveals another picture. 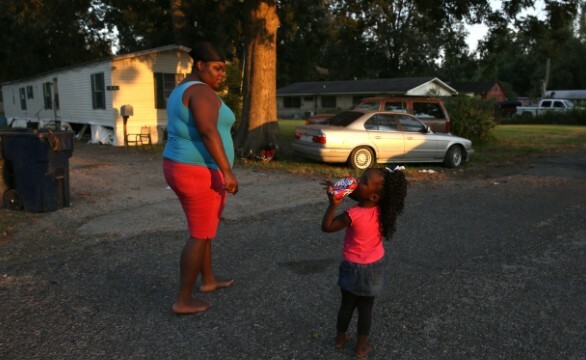 Forty-five percent of the parish's residents receive food stamps, or SNAP benefits. The average payout is $1,492 per person per year. This is a top gripe of the northsiders. What you don't hear discussed as much is that they get help, too. Both the rich and poor are subsidized by government programs. 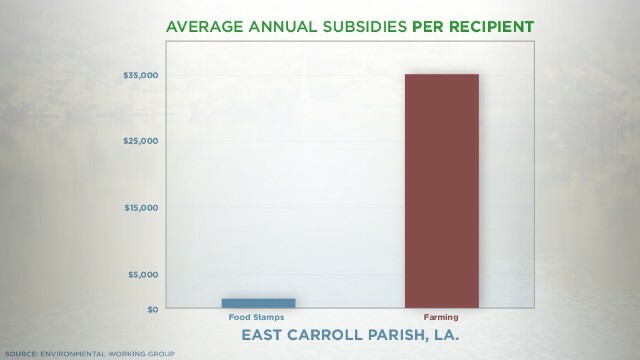 The U.S. Department of Agriculture spent $12.3 million in 2012 subsidizing farming in East Carroll Parish through direct payments, insurance breaks and other subsidies, according to data compiled by the Environmental Working Group, which tracks government farm subsidies. The average farmer who gets a commodity subsidy in the parish received $20,554 in 2010, according to the group. The most highly subsidized farmer that year in East Carroll Parish got more than $655,000 from that one subsidy program. Farmworkers I spoke to made about $7.25 to $10 an hour, even after decades of work. Even in East Carroll Parish, where the cost of living is certainly nothing compared with major U.S. cities, those wages won't support a family. Business owners and farmers here are fond of saying they can't pay higher wages. That's hard for me to believe after looking at the subsidies. "It's really just an unprecedented income guarantee program," said Scott Faber, the Environment Working Group's vice president for government affairs. "It's absurd." The farm subsidy programs grew out of a desire to provide a stable source of food during the Great Depression. Some are still needed, but there is no cap, Faber said, on the income a farmer earns while still receiving government help. And some of the subsidies in East Carroll Parish go to the production of corn, some of which, local farmers told me, is shipped up the Mississippi River for processing into ethanol for fuel, not food. Lake Providence Mayor Robert Amacker, who farms 10,000 acres with his brother, told me some farmers would go out of business without the payments. They're needed, he said, because profits are tied to weather, which is completely unpredictable. But he didn't go so far as defending the full six-figure sums as always justified. "If you take 'em away it's probably gonna hurt us, but I'm not saying we won't survive," he said. "We have in the past." The U.S. House voted in September to cut $40 billion from the SNAP program over the next 10 years. If that cut becomes law, it would make 4 million to 6 million low-income Americans ineligible for assistance, according to the Center on Budget and Policy Priorities, a think tank that studies how public policy affects lower-income people. Other reductions are expected to take effect in November. On a recent Sunday, Gilmore was up by 11 a.m., only four hours after she'd gotten off work at the prison, to get her family ready for church at New Hope Baptist. She awoke to a wild scene: Grandma yelling at kids, kids running around looking for shoes. It was nearly noon by the time everyone was running out the door, which sticks so hard you have to pull it with two hands and all of your body weight. One of Gilmore's grandsons was last out of the trailer. As he ran toward the car his wide-brimmed hat flew off his head. "Hey!" he yelled at the wind. He mashed it on his head and it flew off not one but two more times. "I wonder if I have a WITNESS in here!?" "We got people that are desperate for jobs," Owens shouted, eventually becoming so worked up that he wiped his head with a towel. Sweat seeped through his pink tuxedo vest. "The Lord said, 'I will supply all of your needs according to my riches and gold.' He did NOT SAY he would supply your wants for ya." "All right pastor!" Gilmore said. "If this town's gonna ever progress, we're going to have to come together!" The more time passed, the more worked up Owens became. He walked out in front of the podium and stood on one foot, shaking violently. One of the amplifiers in the small, wooden church was misfiring, and the speaker system occasionally let out deafening squeals. "I said, 'He'll do it!' " the reverend said. "Yes, he will!" Gilmore said. You can't leave Lake Providence thinking it's a bad town. Doing so would miss the point, entirely. It's a beautiful place that, since 1994, when Time magazine named it the "poorest place in America," has been trying to define itself in opposition to that title. Genuine progress has been made. Myriant, a chemical manufacturing company, recently opened a place in Lake Providence with a $50 million grant from the Department of Energy. The company says it's created 50 new jobs. A woman from the south side of the lake opened a bustling restaurant called My Dream Eatery, which aims to pay its employees a living wage, not just the minimum. I met several local public school graduates who were headed off to college this fall. Williams, the sheriff, is trying to rid the town of its drug problems. He's the first black sheriff in the parish's history, and he's respected by nearly everyone in town, including members of the white community. And a host of people has moved to Lake Providence to try to help the community move past its divisions. An Irish-Catholic nun, Bernadette Barrett, or Sister Bernie as everyone calls her, said she moved here after her employer decided it would be more useful to send a mission of nuns to this part of Louisiana than to Haiti, which had been the plan. And on a recent Saturday, Lake Providence held an annual Soul Food Festival. People from both sides of the lake came together for corn bread, crawfish and chitlins. "We've got a long way to go, but, you know, for the last 38 years we've been going down, down, down, down. At some point, you have to hit bottom," Amacker, the mayor, told me. "When you hit bottom, the only place to go is up. I think we're almost there." Farmers are among the wealthier people in East Carroll Parish, Louisiana. "You never dream about a big ol' house?" That's Gilmore talking to me in her maroon Ford Taurus. The reality is I don't dream about big houses and never have. I grew up in a two-story house with four bedrooms and 3½ baths. We had linoleum and then tile in the kitchen. I'm pretty sure I've slid across it in socks a time or two. I had it easy. Gilmore and others should, too. The problem with 2013 America is we don't believe that anymore. We believe in the rich and the rest. It seems obvious to us -- or immutable -- that some should have a better shot at financial success than others. That, in and of itself, is heartbreaking. We've lowered our expectations -- resigned ourselves to a country where class determines worth. The rich fund political campaigns, and politicians cow to their interests. Raising the minimum wage to the point that it's livable and increasing taxes on the wealthiest Americans would help narrow the rich-poor gap, according to some economists. But politicians don't have incentive to pass those reforms. Many of the rich don't want them. It's remarkable to me that Gilmore and other poorer residents of Lake Providence are not more resentful. "They got money and I don't," she told me. "I don't feel bad. I guess I just wanna be blessed to be one of the ones that has money." For the most part, richer people I met in Lake Providence want to help, too. Terral, the doctor's son and man of industry, has helped rebuild homes south of the lake. "I can't imagine that we in America would allow this to happen to so much of our people," said Tom Gattle, Terral's son-in-law, who runs a major river transportation service company in town. Those attitudes tell me there's room for reconciliation -- and shared empathy -- in this place of haves and have-nots. There's room in America, too. If more of us saw how the other side of the lake lives, and if we really worked to understand the systems -- the schools, the taxes, the wages, the history -- that create and maintain economic injustice, I've got to think we'd work together to build a sturdier bridge to the other side. Those bridges need to start going up soon. The longer hard-working people such as Gilmore spin their wheels, the more likely they will become cold and resentful or, worse, give up. Gilmore puts her hopes in her youngest daughter, Shinya. Maybe the 9-year-old will be the first in her family to go to college? Gilmore has been tutoring Shinya, writing math problems on the walls in a back room in the trailer, where the family has a computer but no Internet. Shinya reads to her nieces and nephews, too, and makes them flash cards. That makes Gilmore think she'd make a good teacher. Or maybe a doctor. "I'm hoping for the doctor," she said, laughing. "I want her to be somewhere so she can be comfortable." Gilmore's own dreams, though, are fading. She'd like to go back to school to become a nurse, but she doesn't see how that is possible, financially or logistically. Too many people depend on her. And she hasn't dreamed about that big house in years. Hasn't glided across those slick floors in her socks. "I don't know what I dream about now, I be so tired when I lay down, I be so frustrated," she told me as we drove to work. "I don't even have a dream I guess." That may be the most frightening thing about the staggering economic inequality that plagues Lake Providence and modern America. It changes the way we see each other. And the way we see ourselves. Follow us @CNNOpinion on Twitter. Columnist John Sutter journeys to the place with the highest level of income inequality in the United States. What does inequality look like where you live? iReport would love to see. You might assume New York is the American capital of income inequality. You'd be wrong. Policies that favor the rich keep the gap wide, John Sutter writes. What is income inequality, anyway? President Obama called it "the defining issue of our time" in his 2012 State of the Union, but he did so without ever uttering the phrase "income inequality." Learn whether you're a member of the 99% or the famous 1%. If wages kept pace with productivity, most of us would be richer. But by how much? Will your kids be rich? The answer may depend partly on your income. Find out their odds with this calculator. Earlier this week, John Sutter asked readers of his column to submit ideas for a list of "99 must-reads on income inequality." Here's the list. Is class the new race? Economic justice, as President Obama argued, is the unfinished business of the Civil Rights movement. I'll spare you the stats and simply ask one question that's not considered nearly often enough in the post-Occupy era: Is America's current income distribution fair? Should we vilify the rich? We've turned the rich into caricatures. It's getting harder to shock people with stats about income inequality. Maybe the debate should focus on morality.